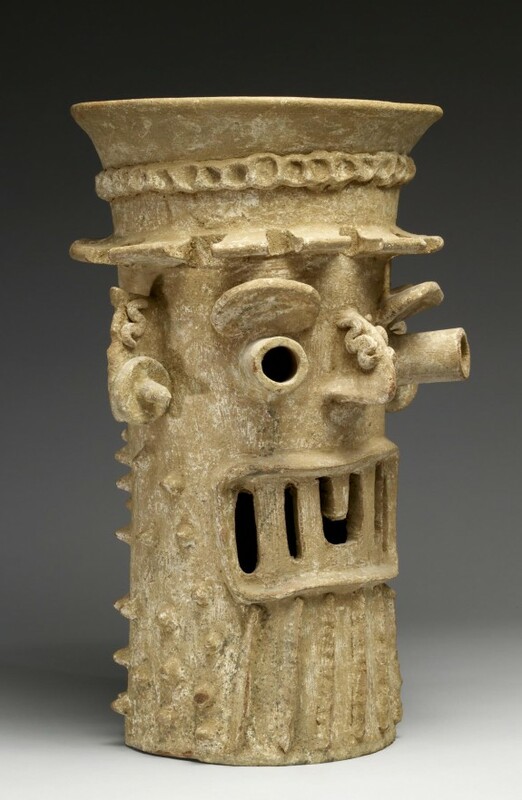 Description Large incense burner stands are a hallmark of the Postclassic period in Colima. The stands likely were placed on altars or the exteriors of temples, a low dish with burning coals and incense being placed either atop the columnar stand or underneath it; the smoke rose through the column and issued from openings in the face. The rounded eyes recall the Central Mexican rain deity Tlaloc, this distinctive representational style perhaps having been appropriated from Central Mexico and adapted by the peoples of Colima as part of socioeconomic interaction. During the Postclassic Period, West Mexican peoples increasingly were in contact with highland Mexico, trading marine resources (especially shells), coveted green stones and other lithic materials, and copper objects made in West Mexico. The spikes and flanges on this stand not only served to dissipate heat absorbed from the burning coals; they also may symbolize the spikes of the ceiba, the tallest tree in the Mesoamerican forest. Among the Maya and other Mesoamerican societies, the ceiba was the model for the World Tree at the center of the cosmos, which maintained the universe's tripartite structure (heavens, earth, and underworld). The ceiba-World Tree also provided a supernatural pathway for religious practioners' spiritual journeys among the three realms. Provenance Private collection, New York; Ron Messick Fine Arts, Santa Fe, New Mexico [date and mode of acquisition unknown]; John G. Bourne, August 31, 1998, by purchase; by bequest to Walters Art Museum, 2017.